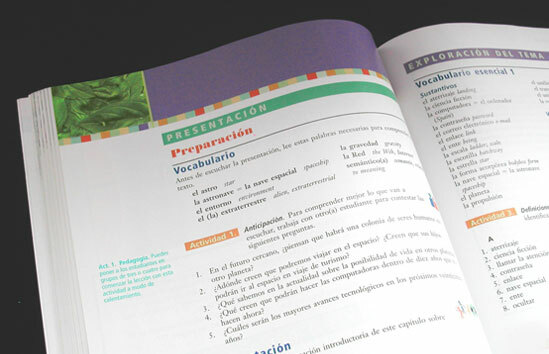 Language books often have a wide variety of pedagogical structures like the objective boxes, maps and photo-image timeline of the Pueblos' chapter opener. Our goal was to bring in the feel of a local village without losing legibility. Using colorful striped graphics along with basketry, Guatemalan fabric and even basil from our garden, our objective was to create a bright, fun, accessible language book.